So, for The Scarborough Hospital, we developed an ad campaign that put human faces behind the healthcare. Now the hospital enjoys a healthier relationship with their community. The Scarborough Hospital is both the largest employer in Scarborough and Canada’s largest urban community hospital. With a staff of 3,700 and 600 beds, the institution receives almost 200,000 patients every year and handles everything from routine tests to emergency trauma cases. Yet these impressive figures were actually working against the institution. For the hospital was so big, the community it served actually saw it as impersonal, and felt emotionally disconnected from it. The Scarborough Hospital asked Company B to help improve community understanding, trust and support. We quickly realized that many of the people who worked at the hospital also lived in Scarborough. Which meant that The Scarborough Hospital was not just a reflection of its community. It actually was the community. And so our solution worked from the inside out. We created an ad and poster campaign that featured hospital staff members. 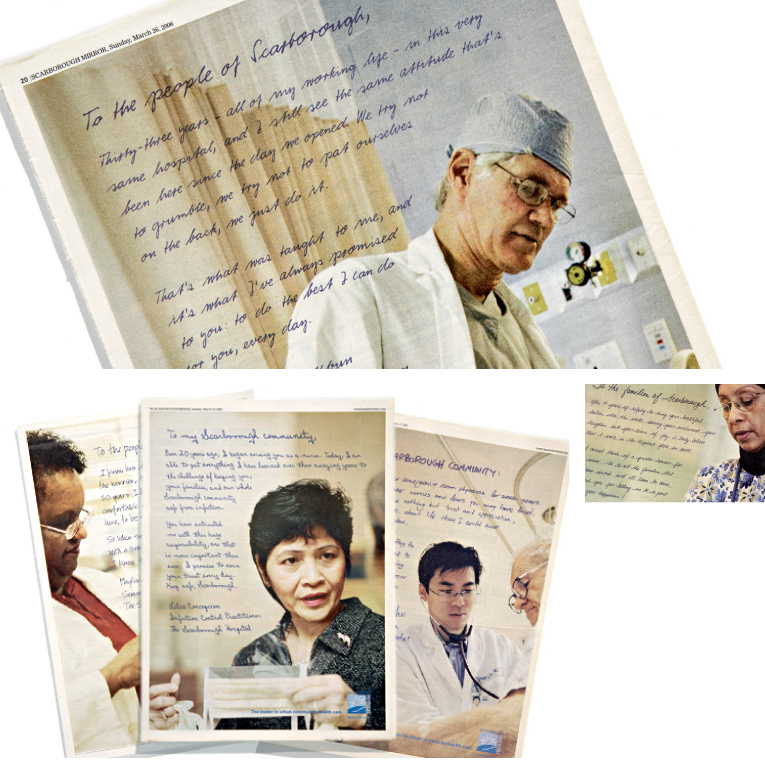 In each ad and poster, the staff members talked about how proud they were to work at the hospital, how much they enjoyed serving the community, and how each felt a personal connection and dedication to their jobs and the hospital itself. The campaign celebrated the hospital staff, bringing them into the story in a real and personal manner. And it sent the message that The Scarborough Hospital was made up of members of the community, serving the community. In keeping with the grass roots nature of the effort, ads ran in the Scarborough Mirror, the local community newspaper, and posters hung in the hospital. Together the work captured the truth of The Scarborough Hospital, and communicated a promise: that no matter who you were, if you came to The Scarborough Hospital, you would be taken care of. Because that's what neighbours do.